New, healthy popcorn is coming to town. They say that a woman has many cravings when she's pregnant. It didn't quite work that way for Darien native Kristy Lewis, but it's safe to say that her newborn son, Quinn, had quite an influence on her new business. A popcorn lover for life and a woman with an entrepreneurial spirit, Lewis and her husband, Coulter, have embarked on a mission to create the perfect bag of microwave popcorn -- and market it. As a personal touch, they decided to name their business Quinn Popcorn after their son, born Aug. 31. "It was kind of now or never," she said. "We literally came home from the hospital and we were working on it the next day. It's been really crazy the amount of work we put into this." So what's so great about the popcorn? Lewis said after many movie nights of eating flavorless microwave popcorn that contains salt, hydrogenated fats, artificial flavors and cooked in a Teflon bag that she said is not environmentally-friendly, the couple started thinking to start their own business creating the perfect gourmet microwave popcorn about five years ago. So they began doing research, talking to other entrepreneurs, and figuring out where to source ingredients and how to market the product. Countless hours were spent talking to family farmers in California for rosemary, or Vermont for maple sugar. And of course, plenty of test batches in the kitchen and taste testing with family and friends. "We ate three bags for dinner last night," she said. "We want our friends and family to be part of this process. We think it's a fun experience." What's different from some of the major-marketed brands is the unique hands-on experience they are trying to create for the customer. Each bag of popcorn comes with a pouch of oil and a spice pouch so the user can add it on their own. This also allows the popcorn to be sold in 100-percent compostable paper bags, rather than specially-lined bags designed to soak up oils. 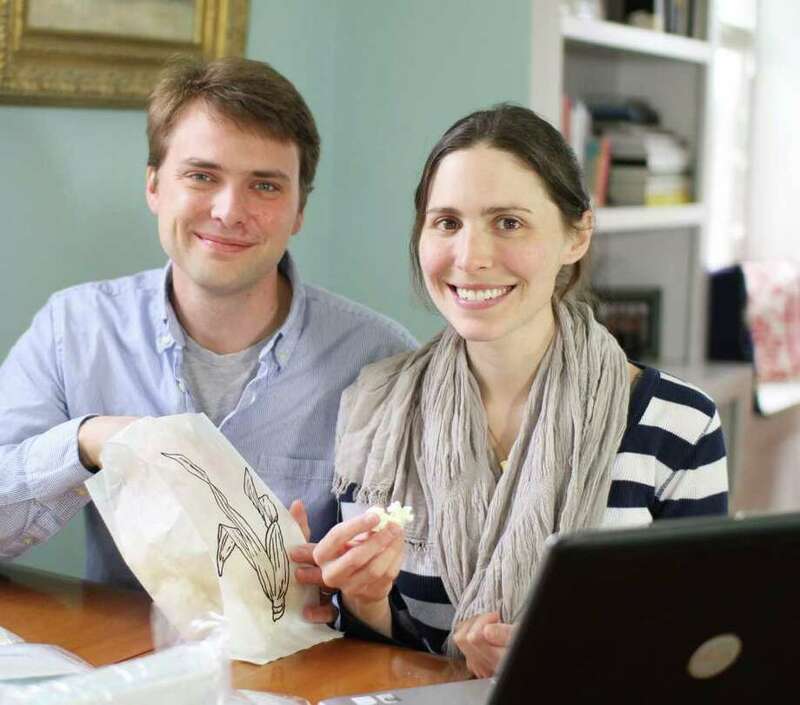 The couple plan to sell the popcorn in specialty markets such as Whole Foods, Palmer's and Rowayton Market this summer, as well as in Nantucket and some Boston-area markets. A final price for the product has not been set. Perhaps what is different about Quinn Popcorn is that the process of inventing their business from scratch is something everyone can experience. The Lewis have created an online blog at www.quinnpopcorn.com that follows everything they do in their business, from describing the creation of the brand's logo to what's its like to source ingredients. There are lots of photos -- browsers can see pictures of the fresh maple sugar that goes into the bags of popcorn. They can be followed on Facebook, and there's even a "flavor poll" that allows users to decide what they think should be the flavors developed. So far, the popcorn will be sold in sea salt with lemon zest, maple, and Parmesan rosemary flavors. Both Coulter and Kristy are Darien natives, high school sweethearts who graduated from Darien High School in 1999. After graduation, Coulter attended Cornell, while she went to the New School in New York City and studied journalism and history. After college, the couple moved to West Palm Beach, Fla., for three years, and then up to Boston three years ago where he took a job as a product designer for a consulting firm. She taught in the Boston suburb of Brookline for a time before moving on to an executive assistant position at Harmonix Music, the company that developed video games such as Rock Band. Today, the couple lives in Arlington, Mass. "When you are a new mother you have to really want this to make it work," she said. "It's so much fun, even though it's exhausting. When I was pregnant we started experimenting with business names and nothing stuck. It's about him. I want to stay home and raise him, but I want to start my own company."